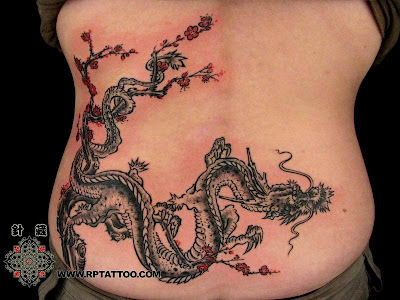 This Chinese dragon tattoo is mixed with a tree, which makes it like water and ink painting style. To the Chinese, the Imperial Dragon or Lung, is considered to be the primary of four benevolent spiritual animals, the other three being the phoenix, the unicorn and the tortoise. Having unrivaled wizdom and power the dragon symbolized the Emperors of China themselves, who were actually called dragons. Hsi, China's first emperor, was said to have a dragon's tail. Shen Nung, his successor was supposed to have been fathered by a dragon. The Chinese Emperor sat on a dragon throne, rode in a dragon boat and slept in a dragon bed. To distinguish the chinese imperial dragon from all other dragons, only the Imprial Dragon bore five claws.